Tamarack was North America’s newest ski resort, the first four-season development in two decades (since Beaver Creek and Deer Valley in the 80’s). Tamarack is located in western Idaho, just 20 minutes from the vibrant lakeside town of McCall. Tamarack opened for skiing in 2004, on 2,100 acres of slopes served by seven modern lifts. With 42 trails on a long and satisfying 2,800′ vertical drop. Tamarack was in bankruptcy 2009 to 2014, with limited operation, but re-opened under new management with an infusion of $2.6 million, in part by homeowners. This 2018-19 ski season Tamarack has new ownership – TRH who plan to complete the Tamarack Village and invest in the ski resort. Tamarack’s master plan was estimated at $1.5 billion, and much of it is still incomplete. Gorgeous on-mountain lodges and luxury real estate projects in Tamarack Village will hopefully now be finished. The Lodge at Osprey Meadows offers on mountain accommodations, with luxury suite lodging overlooking Osprey Golf Course and the Nordic trails. Morel’s restaurant in the Osprey Lodge is the place to dine at Tamarack, for a leisurely sit down lunch by the fire. Tamarack’s terrain is extremely pleasant from the 7,700′ summit. Tamarack has three terrainparks including Hell’s Canyon Superpipe for the freestyle skiers and riders in the family. Tamarack’s eastern exposure makes the slopes sunny, with spectacular views of the largest mountain wilderness in the lower 48, Frank Church River of No Return Wilderness. Tamarack was perfect for skiing families. The terrain is never too steep, but has fun pitches, dips, rolls and knolls as you descend toward the beautiful Lake Cascade. Take your pick from perfectly groomed runs like Bliss and Serenity, or get in the glades (kids love to ski glades) in Mystery Glades. And that’s just what’ s on the trail map. Tamarack has plenty of backcountry, 5,054 acres, if you are willing to head out to Wildwood , Grouse Bowl or Banana Bowl. Tamarack Resort has passionate homeowners and locals, like tennis stars Andre Agassi and Stefi Graf, who have real estate at the resort. Tamarack could turn out to be one of the best designed ski resorts with a beautiful ski village and highly scenic skiing. 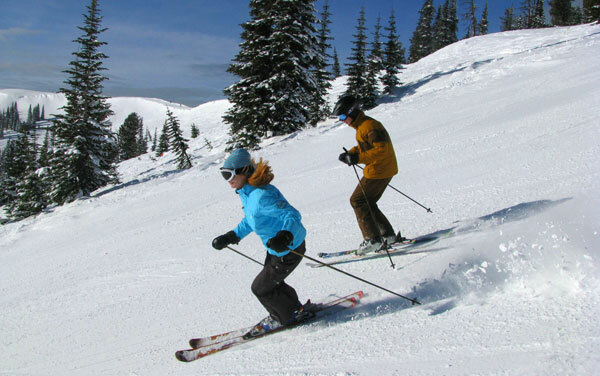 While you are in this beautiful part of Idaho, skiers should also visit nearby Brundage and stay at the elegant Shore Lodge in McCall, and ski Soldier and Sun Valley as well.